Satellite glial cells (SGC) in sensory ganglia tightly envelop the neuronal cell body to form discrete anatomical units. This type of glial cell is considered neuroectoderm-derived and provides physical support to neuron somata. There are scattered hints in the literature suggesting that SGC have an immune-related function within sensory ganglia. In this study, we addressed the hypothesis that SGC are tissue-resident APC. The immune phenotype and function of a large series (n = 40) of human trigeminal ganglia (TG) were assessed by detailed flow cytometry, in situ analyses, and functional in vitro assays. Human TG-resident SGC (TG-SGC) uniformly expressed the common leukocyte marker CD45, albeit at lower levels compared with infiltrating T cells, and the macrophage markers CD14, CD68, and CD11b. In addition, TG-SGC expressed the myeloid dendritic cell (DC) marker CD11c, the T cell costimulatory molecules CD40, CD54, CD80, and CD86 and MHC class II. However, the mature DC marker CD83 was absent on TG-SGC. Functionally, TG-SGC phagocytosed fluorescent bacteria, but were unable to induce an allogeneic MLR. Finally, TG-infiltrating T cells expressed the T cell inhibitory molecules CD94/NKG2A and PD-1, and the interacting TG-SGC expressed the cognate ligands HLA-E and PD-L1, respectively. In conclusion, the data demonstrate that human TG-SGC have a unique leukocyte phenotype, with features of both macrophages and immature myeloid DC, indicating that they have a role as TG-resident APC with potential T cell modulatory properties. Sensory ganglia are part of the peripheral nervous system. They contain cell bodies of sensory neurons establishing the connection between the periphery and CNS. Sensory ganglia lack a blood-nerve barrier and enclose a high number of satellite glial cells (SGC)3 (1, 2, 3). SGC are considered to be neuroectoderm-derived and involved in the maintenance of sensory neuron homeostasis by regulating extracellular ion and nutrient levels within sensory ganglia (2). In contrast to CNS-resident glial cells, like astrocytes and microglia, SGC have a distinct interaction with neurons (2, 3). They directly associate with the neuronal soma, so that each neuronal cell body is completely surrounded by a sheet of several SGC providing physical support and a protective barrier (3). The numerous fine invaginations between the neuron and SGC sheath illustrate their intimate association (2, 3). Upon mechanical injury to sensory neurons, SGC undergo morphological changes, proliferate, and up-regulate a variety of growth factors, cytokines, and the glial marker glial fibrillary acidic protein (2, 4, 5). Human α-herpesviruses, like HSV, are a common threat to human sensory ganglia. HSV establishes a lifelong latent infection in neurons within sensory ganglia, predominantly the trigeminal ganglion (TG), and reactivates intermittently (6). Recent studies in mice and humans emphasized the importance of infiltrating T cells to control latent HSV infections in sensory ganglia (7, 8, 9). Virus-specific T cells are directly juxtaposed to latently infected neurons, produce cytokines and cytolytic effector molecules, but do not induce neuronal damage (7, 8, 10, 11, 12). Current data suggest that the neurons themselves or hitherto unrecognized resident cells in latently infected sensory ganglia induce and coordinate this nonpathogenic chronic T cell response (8, 10, 11, 12). In this study, we addressed the hypothesis that SGC are tissue-resident APC. The availability of a series of fresh postmortem human TG specimens enabled us to combine ex vivo and in situ analyses for the phenotypic and functional characterization of human TG-resident SGC (TG-SGC). Heparinized peripheral blood and TG specimens, i.e., left and right TG, were obtained from 40 subjects (median age 79 years, range 41–94 years) at autopsy with a mean postmortem interval of 6 h (range 2.5–15.5 h). The TG tissue panel consisted of 34 donors with a CNS disease (mainly Alzheimer’s disease and Parkinson’s disease) and six donors without evidence of CNS disease. The cause of death was not related to α-herpesvirus infections. No significant differences in the immunological parameters analyzed were detected between donors with or without a history of CNS disease (data not shown). Specimens were either snap-frozen (n = 23) or transferred to tubes (n = 17) containing culture medium consisting of RPMI 1640 (Lonza) supplemented with heat-inactivated 10% FBS (Greiner) and antibiotics. Written informed consent from the donor or next of kin was obtained. The local ethical committees approved the study, which was conducted according to the tenets of the Declaration of Helsinki. Generation of single cell suspensions from human TG was performed essentially as previously described (12). In brief, the TG were fragmented and subsequently treated with Liberase Blendzyme 3 (0.2 U/ml, Roche) at 37°C for 1 h. Dispersed cells were filtered through a 70-μm pore size cell strainer (BD Biosciences), and the flow-through was collected in PBS containing 1% FBS. From the same donor, PBMC were isolated from heparinized peripheral blood (∼4 ml per donor) by density gradient centrifugation on Ficoll-Hypaque (12). Donor PBMC and TG single cell suspensions were directly used for phenotypic and functional analyses. Donor-matched PBMC and TG cells were subjected to multicolor flow cytometric analyses using the following fluorochrome-conjugated mAbs: CD3-allophycocyanin (UCHT1; DakoCytomation), CD11b-PE (Bear-1; Beckman Coulter), CD11c-allophycocyanin (S-HCL3; BD Biosciences), CD14-FITC (TÜK4; DakoCytomation), CD40-FITC (5C3; BD Biosciences), CD45-PerCP (2D1; BD Biosciences), CD54-FITC (6.5B5; DakoCytomation), CD68-PE (Y1/82A; BD Biosciences), CD80-FITC (MAB104; Beckman Coulter), CD83-allophycocyanin (HB15e; BD Biosciences), CD86-PE (FUN-1; BD Biosciences), HLA-DR-PerCP (L243; BD Biosciences), CD94-FITC (DX22; eBioscience), NKG2A-allophycocyanin (131411; eBioscience), programmed death (PD)-1-PE (MIH4; eBioscience), and PD ligand 1 (PD-L1)-PE (MIH1; eBioscience). Cells were labeled according to the manufacturers’ instructions and appropriate isotype- and fluorochrome-matched unrelated mAbs were included as negative controls. Cells and data were analyzed on a BD FACSCalibur flow cytometer and BD CellQuest Pro software (BD Biosciences). Snap-frozen TG were embedded in Tissue Tek OCT compound (Sakura) and cut into 6-μm sections on a Leica CM 3050S cryostat. Sections were fixed in acetone for 10 min and incubated with the following unconjugated mAbs according to the manufacturer’s instructions: CD11b (ICRF44; BD Biosciences), CD11c (B-ly6; BD Biosciences), CD14 (TÜK4; DakoCytomation), CD16 (3G8; BD Biosciences), CD40 (5D12; Pangenetics), CD45 (2B11+PD7/26; DakoCytomation), CD54 (LB-2; BD Biosciences), CD64 (32.2; DakoCytomation), CD68 (KP1; DakoCytomation), CD80 (M24; Innogenetics), CD83 (Hb15a; Beckman Coulter), CD86 (1G10; Pangenetics), CD94 (HP-3B1; Immunotech), HLA-E (4D12) by gift from D. E. Geraghty (Fred Hutchinson Cancer Research Center, Seattle, WA), PD-1 (MIH4; eBioscience), and PD-L1 (MIH1; eBioscience). Primary mAb were visualized using the avidin-biotin system (DakoCytomation) and AEC (3-amino-9-ethylcarbazole; Sigma-Aldrich) as substrate, and sections were counterstained with hematoxylin (Sigma-Aldrich), examined under a Zeiss Axioskop, and photographed using a Nikon DC-U1 camera. For each donor and each marker, three sections and three fields per section were analyzed. Human tonsil sections were used as positive control tissue, and appropriate isotype and conjugate-negative control stainings were included. For double stainings, sections were fixed in acetone, and endogenous peroxidase activity and endogenous biotin were blocked before incubation with the first primary Ab CD14 (TÜK4) or CD45 (2B11+PD7/26). The first mAb was detected using an avidin-biotin-HRP system (Biogenex). Before substrate incubation, sections were incubated with normal mouse serum (10%) and a CD11c-PE mAb (B-ly6), which was visualized using an anti-PE secondary Ab (AbD Serotec) and an alkaline phosphatase-conjugated tertiary Ab (Sigma-Aldrich). Slides were first developed with Fast blue substrate, followed by incubation with AEC substrate solution. Monocytes and TG-SGC were isolated using anti-CD14 microbeads and a MACS magnetic separator (Miltenyi Biotec) according to the manufacturer’s instructions. T cells were isolated from PBMC of healthy blood donors using anti-CD3 microbeads (Miltenyi Biotec). Flow cytometry confirmed that the enriched cell fractions contained >85% CD14+ cells and >95% CD3+ cells, respectively (data not shown). TG single cell suspensions were incubated with fluorescein-labeled Escherichia coli K-12 strain bioparticles (Invitrogen) in a cell-to-particle ratio of 1:100 according to the manufacturer’s instructions. After incubation at 37°C for 2 h, cells were washed extensively and subjected to flow cytometry or used for immunocytological analyses. For the latter procedure, E. coli-treated TG-SGC were enriched using anti-CD14 beads, spun down onto glass slides, fixed with 4% paraformaldehyde and stained with Alexa Fluor 610-PE-conjugated anti-CD68 mAb (KP1; DakoCytomation). Cytospins were mounted in ProLong Gold anti-fade reagent with DAPI (4′,6-diamidino-2-phenylindole; Invitrogen) and analyzed on a confocal laser-scanning microscope (LSM510 Meta; Zeiss). Pictures were made using multitrack recording with a 405 nm diode, 488 nm argon, and 561 nm diode laser to detect DAPI, fluorescein, and Alexa Fluor 610-PE, respectively. CD14-enriched TG-SGC, peripheral blood-derived monocytes and mature dendritic cells (DC) were used as stimulator cells in allogeneic MLR assays. Due to the low number of monocytes recovered from TG donors’ PBMC, mature DC were generated from peripheral blood samples of healthy blood donors (n = 2). To obtain mature DC, CD14-enriched peripheral blood-derived monocytes were cultured with IL-4 and GM-CSF for 6 days to generate immature monocyte-derived DC, and subsequently matured with a cytokine mixture as previously described (13, 14). The mature DC phenotype, characterized by high CD80, CD83, and CD86 expression (15), was confirmed by flow cytometry (data not shown). The effector cells, i.e., allogeneic peripheral blood T cells, were labeled with CFSE (Invitrogen) at a final concentration of 0.5 μM. The stimulator cells were cocultured with effector cells at a ratio of 1:10 at 37°C. At day 7, cells were harvested for flow cytometric analyses. Cells were stained with CD3-allophycocyanin (UCHT1; DakoCytomation) to discriminate between T cells and stimulator cells. We have previously shown that TG-SGC uniformly express MHC class II, suggesting that they have a role as APC (12). 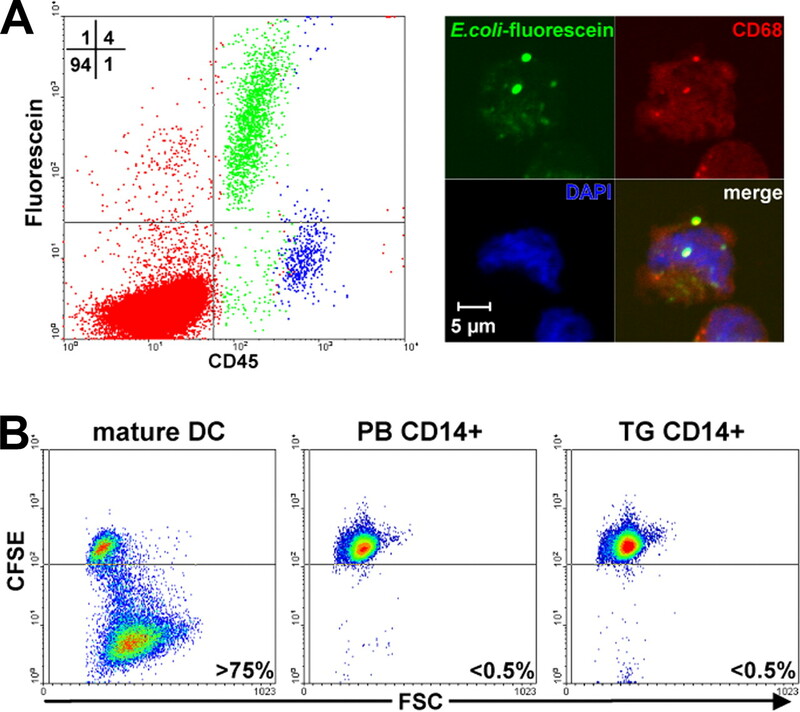 Tissue-resident APC, including macrophages and DC, express the common leukocyte marker CD45 enabling their distinction from stromal cells like fibroblasts. Paired TG-derived cells and PBMC samples were assayed for CD45 expression. 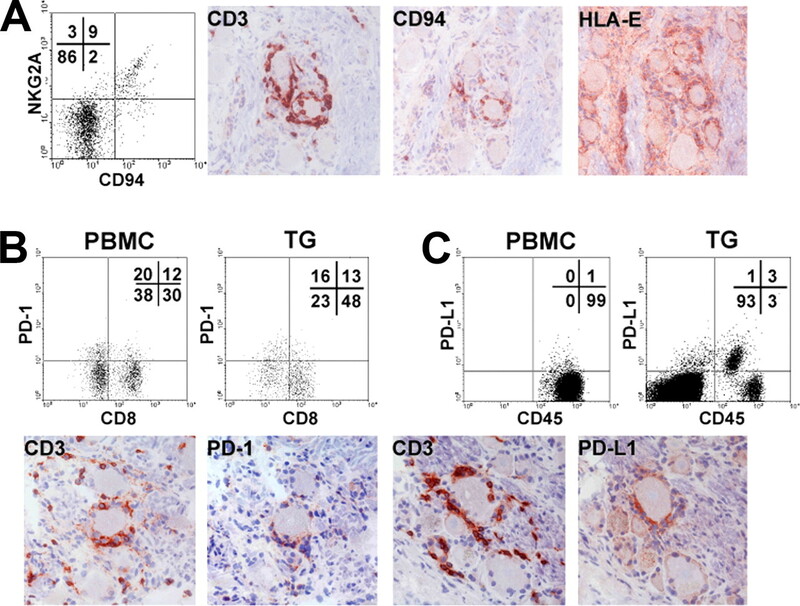 In contrast to PBMC, the TG-derived CD45+ cell pool included two distinct cell populations: CD45high and CD45low cells (Fig. 1⇓A). Whereas the CD45high cells consisted mainly of T cells (data not shown), all CD45low cells expressed the monocyte/macrophage marker CD14 (Fig. 1⇓B and Table I⇓). In situ analyses showed that CD14 was expressed by TG-SGC (Fig. 1⇓B). As hinted upon by a previous report (8), the macrophage-specific marker CD68 was expressed intracellularly (Fig. 1⇓C and Table I⇓), but not at the cell surface of TG-SGC (data not shown). Additionally, TG-SGC selectively expressed Ag uptake receptors like CD11b and CD11c (Fig. 1⇓, D and E, and Table I⇓), as well as CD16 and CD64 (data not shown). In situ double stainings confirmed the flow cytometry data and demonstrated coexpression of CD14, CD45 and CD11c on TG-SGC (Fig. 2⇓). Human TG-resident SGC express macrophage- and DC-specific markers. A, Dot plots of paired TG cells (left) and PBMC (right) stained for CD45 to demonstrate that human TG harbor a unique cell population expressing CD45 at low levels (gate R2). CD45low and CD45high cells are arbitrarily green and blue in all dot plots, respectively. 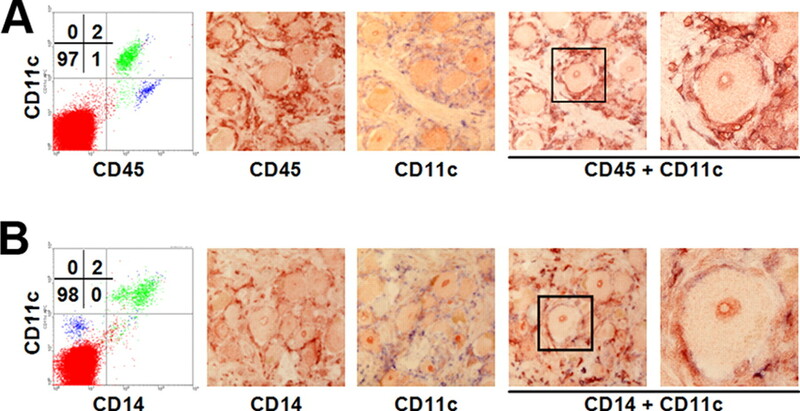 Subsequent panels show representative ex vivo flow cytometric analysis (left) (n = 14 donors) and in situ analysis (right) (n = 6 donors) of the expression of CD14 (B), CD68 (C), CD11b (D), CD11c (E), CD80 (F), CD86 (G), CD83 (H), CD54 (I), and CD40 (J) detected. The number for each quadrant in dot plot represents the percentage of cells expressing the indicated marker defined on matched isotype control mAb stainings. Sections were developed with AEC (bright red precipitate) and counterstained with hematoxylin (blue nuclei). Original magnifications are ×200 (B–E, and J) and ×400 (F–I). Human TG-resident SGC express APC markers. Human TG single cell suspensions, and frozen TG biopsy specimens, were analyzed for the markers CD45 and CD11c (A), and CD14 and CD11c (B) in cytometry analysis (n = 14 donors) and double-color in situ analysis (n = 6 donors) on consecutive sections, respectively. CD45low and CD45high cells are arbitrarily green and blue in all dot plots, respectively. The number for each quadrant in the dot plot represents cells expressing the indicated marker. Slides were developed with AEC and Fast blue resulting in red and blue staining patterns, respectively. A double positive cell, stained purple, is enlarged for experiment (far right). Original magnification is ×200. The complement receptor CD11c is commonly used as a marker to discriminate between myeloid (DC; CD11c+) and plasmacytoid (CD11c−) DC (16). Maturation of myeloid DC is characterized by up-regulation or induction of surface markers like MHC class II and the costimulatory molecules CD80, CD83, and CD86 essential for T cell interaction and stimulation (15). Surface expression of CD83 is considered characteristic for functionally mature DC (17). The expression of CD11c and MHC class II on TG-SGC prompted us to determine the expression of additional DC markers. Whereas the TG-SGC expressed both CD80 and CD86 (Fig. 1⇑, F and G and Table I⇑), the mature DC marker CD83 could not be detected (Fig. 1⇑H and Table I⇑). Furthermore, TG-SGC coexpressed MHC class II and the T cell adhesion molecule CD54 (Fig. 1⇑I). Except for CD40, all markers determined were expressed uniformly on all TG-SGC. Whereas all TG-SGC of the TG donors (n = 4) analyzed were CD40+ by flow cytometry, in situ analyses revealed interdonor variation of CD40 expression on TG-SGC. Two of six TG donors analyzed showed weak but positive CD40 staining on TG-SGC, which was occasionally associated with T cell clusters (Fig. 1⇑J). The discrepancies observed could be due to the use of two different anti-CD40 mAbs in the separate assays, and, in case of the differential CD40 expression observed in the in situ analyses, may be attributed to unknown TG donor-specific characteristics. Similar to the other markers analyzed, CD40 expression did not correlate with the presence of interacting T cells or latent α-herpesvirus infection (data not shown). Table II⇓ presents a comparative overview of the phenotype of human TG-SGC. A critical role of macrophages is to phagocytose cellular debris and pathogens. Because the TG-SGC have a macrophage phenotype, we determined their capability to phagocytose bacterial particles. Whole TG cell suspensions were incubated with fluorescein-conjugated E. coli after which the phagocytic cell type was identified by flow cytometry. Bacteria were predominantly associated with the CD45low TG cells, identified in the experiment as TG-SGC (Fig. 3⇓A). Because this assay does not discriminate between membrane bound and internalized bacteria, the E. coli-treated TG-SGC were isolated using anti-CD14 magnetic beads and subsequently subjected to immunocytology. Confocal laser scanning microscopy revealed that the bacteria colocalized with the late endosome marker CD68 (Fig. 3⇓A), demonstrating that TG-SGC have actively phagocytosed the bacteria. Human TG-resident SGC share functional characteristics with macrophages and immature myeloid DC. A, Human TG-SGC were incubated with fluorescein-conjugated bacteria to determine their phagocytic function by flow cytometry (left) and confocal laser scanning microscopy (right). CD45low and CD45high cells are arbitrarily green and blue in the dot plot, respectively (left). Cytospins of CD14-enriched TG-SGC treated with fluorescein-conjugated bacteria (bacteria in green) were stained for CD68 (late endosomes in red) and DAPI (cellular nuclei in blue) and examined by confocal laser scanning microscopy (right). B, Dot plots of a representative allogeneic MLR using mature monocyte-derived DC generated from peripheral blood-derived monocytes of a healthy blood donor (DC, left), and CD14-enriched peripheral blood monocytes (PB CD14+, middle), and CD14-enriched TG-SGC (TG CD14+, right) recovered from the same TG donor, hereby used as stimulator cells in combination with CFSE-labeled allogeneic T cells. The percentage indicates the frequency of T cells that proliferated upon incubation at 37°C for 7 days. Results are representative of two experiments performed on two TG donors. Although immature myeloid DC primarily function as phagocytes, DC maturation is associated with up-regulation of costimulatory and MHC molecules, secretion of cytokines, down-regulation of phagocytic capacity, and increased ability to induce T cell responses (15). It is well established that mature DC are potent stimulators of an allogeneic MLR, a characteristic that distinguishes them from other APC (18). Because TG-SGC expressed a myeloid DC phenotype, they were used as stimulator cells in allogeneic MLR assays. From the same donor, peripheral blood-derived CD14+ monocytes and CD14+ TG-SGC were cocultured with CFSE-labeled allogeneic T cells. In contrast to mature monocyte-derived DC, both monocytes and TG-SGC were unable to induce T cell proliferation (Fig. 3⇑B), indicating that human TG-SGC resemble immature myeloid DC both phenotypically and functionally. Although neuron-interacting CD8+ T cells express cytolytic molecules, like perforin and granzyme B, neuronal damage is not observed in type-1 HSV latently infected TG, suggesting that the cytolytic activity of the CD8+ T cells is inhibited (7, 8, 9, 10, 11, 12, 19). Recently, Suvas et al. (19) have shown that the NK inhibitory molecule complex CD94/NKG2A prevents CD8+ T cell-mediated TG neuron destruction in mice. Whereas the majority of the TG-infiltrating HSV-specific CD8+ T cells expressed CD94/NKG2A, both neurons and CD11b+ cells expressed the cognate ligand Qa-1b (19). Analogous to the mouse, human TG-infiltrating T cells coexpressed CD94 and NKG2A (Fig. 4⇓A). Moreover, the frequency of CD94/NKG2A+ T cells in TG (mean frequency 13 ± 4%) was higher compared with peripheral blood (mean frequency 3 ± 1%), suggesting selective infiltration or differentiation of T cells to express CD94/NKG2A locally. The cognate receptor HLA-E (20) was expressed throughout the TG tissue, including TG-SGC, and CD94 expression colocalized with CD3 within neuron-interacting T cell clusters (Fig. 4⇓A). Human TG-infiltrating T cells express inhibitory molecules. A, Dot plot of ex vivo flow cytometry (left) on CD94 and NKG2A expression on gated T cells, and in situ analyses of CD3, CD94, and HLA-E on consecutive sections. B and C, Dot plots of ex vivo flow cytometric (top) and in situ analyses (bottom) of CD3 and PD-1 (B), and CD3 and PD-L1 (C) on consecutive sections. The number for each quadrant in dot plot represents the percentage of cells expressing the indicated marker defined on matched isotype control mAb stainings. Dot plots in A and B are gated on CD3+ cells. Representative data from six TG donors are shown. Sections were developed with AEC (bright red precipitate) and counterstained with hematoxylin (blue nuclei). Original magnification is ×200. In addition to NK inhibitory molecules, several studies have indicated that the molecule PD-1 and its ligand PD-L1 negatively regulate T cell effector functions (21, 22, 23, 24, 25). Both CD4+ and CD8+ TG-infiltrating T cells expressed PD-1, but percentages and expression levels did not differ between donor-matched TG-derived T cells (mean 29 ± 7%) and peripheral blood T cells (mean 35 ± 12%) (Fig. 4⇑B). However, in situ analyses revealed that neuron-interacting T cell clusters tended to have a higher PD-1 expression, compared with scattered T cells (Fig. 4⇑B). Notably, PD-L1 expression was confined to TG-SGC and appeared to be higher on TG-SGC in proximity to the T cell clusters (Fig. 4⇑C). For decades, SGC have been regarded as nursing cells providing physical support to neuron somata in sensory ganglia. The current study demonstrates that human TG-SGC have phenotypic and functional APC properties. Two main findings are reported. First, human TG-SGC have a unique leukocyte phenotype, with features of both macrophages and immature myeloid DC. Second, TG-infiltrating T cells expressed the T cell inhibitory molecules CD94/NKG2A and PD-1, and the interacting TG-SGC expressed the cognate ligands HLA-E and PD-L1, respectively. Current knowledge on CNS-resident glial cells advocate their role as critical participants in the healthy and diseased brain by maintaining axonal integrity and myelination, providing nutrients, controlling synapse formation and function, and immune regulation (26, 27, 28, 29, 30). Whereas macroglia, like astrocytes and oligodendrocytes, are derived from the neuroectoderm (31), microglia express several leukocyte cell markers implicating their origin from myeloid progenitor cells (26, 32). Microglia are the main CNS-resident APC that constantly sense and sample the brain environment and coordinate immune responses in response to danger signals (26, 27, 28). They resemble macrophages and immature myeloid DC and have been implicated in neurodegenerative disorders like multiple sclerosis (27, 29, 30). Both human and rodent microglia express low levels of the membrane molecule CD45, a marker commonly used to distinguish microglia (CD45low) from stromal cells and macroglia (both CD45−) and infiltrating lymphocytes (CD45high) (33, 34). In contrast to CNS glial cells, the immune function of peripheral nervous system resident SGC is poorly defined. Our data demonstrate that human TG-SGC closely resemble CNS microglia both phenotypically and functionally (Table II⇑). Microglia and TG-SGC are CD45low, and express similar macrophage- and DC-associated markers and T cell costimulatory molecules (Figs. 1⇑ and 2⇑, and Table II⇑) (26). Furthermore, both cell types actively phagocytose bioparticles and are unable to induce primary T cell responses (Fig. 3⇑) (35, 36). Hitherto, peripheral nervous system-resident SGC have been considered to be neuroectoderm-derived (2, 3, 37). The current study challenges this concept, suggesting that human TG-SGC arise from myeloid progenitors analogous to microglia (26, 32). Recent data obtained by the Carbone group (38) support this hypothesis. The authors studied the local effector cells involved in maintaining virus-specific CD8+ T cell responses that control HSV-1 latency in sensory ganglia of experimentally infected mice. It was shown that CD8+ T cell homeostasis was depending on a tripartite interaction that includes infiltrating CD4+ T cells and recruited DC. 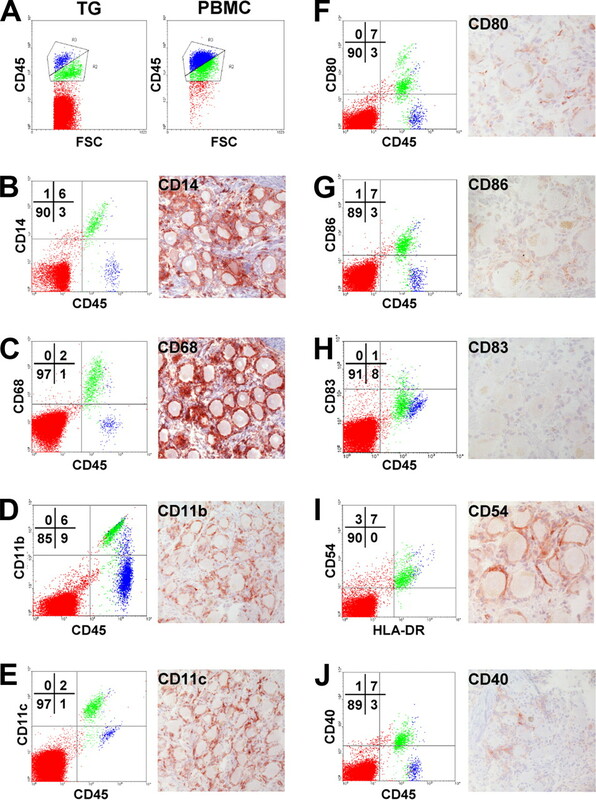 The effector DC originated from circulating monocytes and expressed high levels of CD11b, CD11c, MHC class II, and F4/80. In situ analyses showed that the CD11c+ DC were occasionally found in close proximity to CD8+ T cells, but more strikingly they appeared to surround the neuronal somata (38). The comparable phenotype and anatomic localization of murine sensory ganglia-resident DC and human TG-SGC suggest that they represent the same cell type. This local APC may present the cognate HSV-1 Ags to infiltrating virus-specific CD8+ T cells. Studies in mice support this notion (39, 40). Alternatively, HSV-1-specific CD8+ T cells may penetrate the SGC sheet to interact directly with the latently infected neurons (7). Because neurons do not express MHC class II, infiltrating virus-specific CD4+ T cells most likely interact with TG-SGC. In contrast to a previous study on human TG, the majority of the investigated markers analyzed in this study were uniformly expressed by TG-SGC of the TG donors studied. This finding was irrespective of the HSV status of the donor and varicella zoster virus serostatus, and the presence of infiltrated T cells (data not shown). A major difference between the preceding and present study is the median age of the TG donors analyzed: 29 vs 79 years, respectively (8). Animal studies have demonstrated that aging induces the transition of naive microglia into an activated state, characterized by up-regulation of MHC class II and CD68 (41, 42). Consequently, the discrepancy between both studies may in part be attributed to the relatively high age of the TG donors analyzed in this study. It is generally established that TG-infiltrating CD8+ T cells inhibit HSV-1 reactivation by means of IFN-γ and cytolytic effector molecules (7, 8, 12, 43, 44). Nevertheless, the latently infected neurons encountered are not damaged, suggesting that cytolytic T cell effector functions are inhibited (8, 12, 43). The expression of CD94/NKG2A on human TG-infiltrating T cells is consistent with a previous study on mouse TG, demonstrating that blocking the CD94-NKG2A/Qa-1b interaction in ex vivo TG cultures resulted in neuronal cell lysis (19). CD94 expression in human TG was selectively expressed by T cells interacting with neuronal somata, suggesting an analogous role of the CD94-NKG2A/HLA-E interaction in human latently infected TG. Notably, Qa-1b was expressed by neurons, but also CD11b+ cells in mouse TG (19). The CD11b+ Qa-1b+ cells may represent the effector DC that are functionally involved in controlling local T cell responses in HSV-1 latently infected mouse sensory ganglia (38). In addition to CD94/NKG2A, the data on human TG suggest the involvement of the T cell inhibitory molecule PD-1. Human TG-infiltrating T cells and TG-SGC expressed PD-1 and PD-L1, respectively. Notably, the expression of both markers appeared to be higher within neuron-interacting T cell clusters. IFN stimulation up-regulates PD-1 and PD-L1 expression on receptive cells (22, 45). Consequently, the differential PD-1 and PD-L1 expression observed may be attributed to IFN-γ secreted by activated T cells recognizing the latent virus. Functional studies are mandatory to investigate the role of both the HLA-E/CD94-NKG2A and PD-1/PD-L1 pathway to inhibit cytolytic T cell effector function in human HSV-1 latently infected TG. Moreover, elucidation of the T cell inhibitory mechanisms used in the peripheral nervous system may provide tools for the development of future therapeutic intervention strategies to counteract undue cell damage associated with T cell-mediated chronic diseases. In conclusion, the data presented in this study show that human TG-resident SGC have a unique leukocyte phenotype, sharing properties with macrophages and immature myeloid DC. We hypothesize that TG-SGC are tissue-resident APC involved in sensing the local environment and the control of local T cell responses to protect the irreplaceable neuronal somata in TG. We thank the Netherlands Brain Bank team for their efforts to provide the human TG specimens and are indebted to the donors who agreed to provide TG specimens for research purposes. We also thank D. E. Geraghty (Fred Hutchinson Cancer Research Center, Seattle, WA) for providing the anti-HLA-E mAb 4D12. The authors acknowledge discussions within the European Cooperation in Science and Technology (COST) Action BM0603 Inflammation in Brain Disease Neurinfnet, and networking support from COST. ↵1 This study was supported in part by the International Consortium on Anti-Virals (to M.v.V.) and the Dutch MS Research Foundation (to J.D.L.). ↵3 Abbreviations used in this paper: SGC, satellite glial cell; DC, dendritic cell; TG, trigeminal ganglia; PD, programmed death; PD-L1, PD ligand l.
Bechmann, I., I. Galea, V. H. Perry. 2007. What is the blood-brain barrier (not)?. Trends Immunol. 28: 5-11. Hanani, M.. 2005. Satellite glial cells in sensory ganglia: from form to function. Brain Res. Rev. 48: 457-476. Pannese, E.. 1981. The satellite cells of the sensory ganglia. Adv. Anat. Embryol. Cell Biol. 65: 1-111. Elson, K., A. Simmons, P. Speck. 2004. Satellite cell proliferation in murine sensory ganglia in response to scarification of the skin. Glia 45: 105-109. Lee, S. E., H. Shen, G. Taglialatela, J. M. Chung, K. Chung. 1998. Expression of nerve growth factor in the dorsal root ganglion after peripheral nerve injury. Brain Res. 796: 99-106. Roizman, B., D. Knipe, R. J. Whitley. 2007. . D. Knipe, and P. Howley, eds. Fields’ Virology 5th ed.2501-2601. Lippincott Williams & Wilkins, Philadelphia, Pa.
Khanna, K. M., R. H. Bonneau, P. R. Kinchington, R. L. Hendricks. 2003. Herpes simplex virus-specific memory CD8+ T cells are selectively activated and retained in latently infected sensory ganglia. Immunity 18: 593-603. Theil, D., T. Derfuss, I. Paripovic, S. Herberger, E. Meinl, O. Schueler, M. Strupp, V. Arbusow, T. Brandt. 2003. Latent herpesvirus infection in human trigeminal ganglia causes chronic immune response. Am. J. Pathol. 163: 2179-2184.
van Lint, A. L., L. Kleinert, S. R. Clarke, A. Stock, W. R. Heath, F. R. Carbone. 2005. Latent infection with herpes simplex virus is associated with ongoing CD8+ T-cell stimulation by parenchymal cells within sensory ganglia. J. Virol. 79: 14843-14851. Khanna, K. M., A. J. Lepisto, V. Decman, R. L. Hendricks. 2004. Immune control of herpes simplex virus during latency. Curr. Opin. Immunol. 16: 463-469. Liu, T., K. M. Khanna, X. Chen, D. J. Fink, R. L. Hendricks. 2000. CD8+ T cells can block herpes simplex virus type 1 (HSV-1) reactivation from latency in sensory neurons. J. Exp. Med. 191: 1459-1466. Verjans, G. M., R. Q. Hintzen, J. M. van Dun, A. Poot, J. C. Milikan, J. D. Laman, A. W. Langerak, P. R. Kinchington, A. D. Osterhaus. 2007. Selective retention of herpes simplex virus-specific T cells in latently infected human trigeminal ganglia. Proc. Natl. Acad. Sci. USA 104: 3496-3501. Allard, S. D., K. Pletinckx, K. Breckpot, C. Heirman, A. Bonehill, A. Michiels, C. A. van Baalen, R. A. Gruters, A. D. Osterhaus, P. Lacor, et al 2008. Functional T-cell responses generated by dendritic cells expressing the early HIV-1 proteins Tat, Rev and Nef. Vaccine 26: 3735-3741. Prechtel, A. T., A. Steinkasserer. 2007. CD83: an update on functions and prospects of the maturation marker of dendritic cells. Arch. Dermatol. Res. 299: 59-69. Crow, M. K., H. G. Kunkel. 1982. Human dendritic cells: major stimulators of the autologous and allogeneic mixed leucocyte reactions. Clin. Exp. Immunol. 49: 338-346. Suvas, S., A. K. Azkur, B. T. Rouse. 2006. Qa-1b and CD94-NKG2a interaction regulate cytolytic activity of herpes simplex virus-specific memory CD8+ T cells in the latently infected trigeminal ganglia. J. Immunol. 176: 1703-1711. Kaiser, B. K., F. Barahmand-Pour, W. Paulsene, S. Medley, D. E. Geraghty, R. K. Strong. 2005. Interactions between NKG2x immunoreceptors and HLA-E ligands display overlapping affinities and thermodynamics. J. Immunol. 174: 2878-2884. Blank, C., A. Mackensen. 2007. Contribution of the PD-L1/PD-1 pathway to T-cell exhaustion: an update on implications for chronic infections and tumor evasion. Cancer Immunol. Immunother. 56: 739-745. Maier, H., M. Isogawa, G. J. Freeman, F. V. Chisari. 2007. PD-1:PD-L1 interactions contribute to the functional suppression of virus-specific CD8+ T lymphocytes in the liver. J. Immunol. 178: 2714-2720. Jurado, J. O., I. B. Alvarez, V. Pasquinelli, G. J. Martinez, M. F. Quiroga, E. Abbate, R. M. Musella, H. E. Chuluyan, V. E. Garcia. 2008. Programmed death (PD)-1:PD-ligand 1/PD-ligand 2 pathway inhibits T cell effector functions during human tuberculosis. J. Immunol. 181: 116-125. Hanisch, U. K., H. Kettenmann. 2007. Microglia: active sensor and versatile effector cells in the normal and pathologic brain. Nat. Neurosci. 10: 1387-1394. Nimmerjahn, A., F. Kirchhoff, F. Helmchen. 2005. Resting microglial cells are highly dynamic surveillants of brain parenchyma in vivo. Science 308: 1314-1318. Streit, W. J.. 2004. Microglia and Alzheimer’s disease pathogenesis. J. Neurosci. Res. 77: 1-8. Ulvestad, E., K. Williams, R. Bjerkvig, K. Tiekotter, J. Antel, R. Matre. 1994. Human microglial cells have phenotypic and functional characteristics in common with both macrophages and dendritic antigen-presenting cells. J. Leukocyte Biol. 56: 732-740. Dong, Y., E. N. Benveniste. 2001. Immune function of astrocytes. Glia 36: 180-190. Chan, W. Y., S. Kohsaka, P. Rezaie. 2007. The origin and cell lineage of microglia: new concepts. Brain. Res. Rev. 53: 344-354. Becher, B., J. P. Antel. 1996. Comparison of phenotypic and functional properties of immediately ex vivo and cultured human adult microglia. Glia 18: 1-10. Carson, M. J., C. R. Reilly, J. G. Sutcliffe, D. Lo. 1998. Mature microglia resemble immature antigen-presenting cells. Glia 22: 72-85. Davoust, N., C. Vuaillat, G. Androdias, S. Nataf. 2008. From bone marrow to microglia: barriers and avenues. Trends Immunol. 29: 227-234. Li, H. Y., E. H. Say, X. F. Zhou. 2007. Isolation and characterization of neural crest progenitors from adult dorsal root ganglia. Stem. Cells 25: 2053-2065. Wakim, L. M., J. Waithman, N. van Rooijen, W. R. Heath, F. R. Carbone. 2008. Dendritic cell-induced memory T cell activation in nonlymphoid tissues. Science 319: 198-202. Pereira, R. A., D. C. Tscharke, A. Simmons. 1994. Upregulation of class I major histocompatibility complex gene expression in primary sensory neurons, satellite cells, and Schwann cells of mice in response to acute but not latent herpes simplex virus infection in vivo. J. Exp. Med. 180: 841-850. Liu, T., Q. Tang, R. L. Hendricks. 1996. Inflammatory infiltration of the trigeminal ganglion after herpes simplex virus type 1 corneal infection. J. Virol. 70: 264-271. Dilger, R. N., R. W. Johnson. 2008. Aging, microglial cell priming, and the discordant central inflammatory response to signals from the peripheral immune system. J. Leukocyte Biol. 84: 932-939. Perry, V. H., M. K. Matyszak, S. Fearn. 1993. Altered antigen expression of microglia in the aged rodent CNS. Glia 7: 60-67. Knickelbein, J. E., K. M. Khanna, M. B. Yee, C. J. Baty, P. R. Kinchington, R. L. Hendricks. 2008. Noncytotoxic lytic granule-mediated CD8+ T cell inhibition of HSV-1 reactivation from neuronal latency. Science 322: 268-271. Liu, T., K. M. Khanna, B. N. Carriere, R. L. Hendricks. 2001. Gamma interferon can prevent herpes simplex virus type 1 reactivation from latency in sensory neurons. J. Virol. 75: 11178-11184. Muhlbauer, M., M. Fleck, C. Schutz, T. Weiss, M. Froh, C. Blank, J. Scholmerich, C. Hellerbrand. 2006. PD-L1 is induced in hepatocytes by viral infection and by interferon-α and -γ and mediates T cell apoptosis. J. Hepatol. 45: 520-528.